I am wondering if it is possible to have Rail clone use multiple stacked splines as clipping paths. This would allow for creation of varied floor plates for floor slab geometry. See attached file for more info. In the file you will see several spline subobjects that I'd like to use to clip the segment geometry, but Rail Clone only seems to show a boolean addition of the stacked splnes, rather than clipping each layer of the segment geometry defined by each spline subobject. Can this be added? Perhaps a threshold value for adjusting the range of distance from each spline will clip geometry? 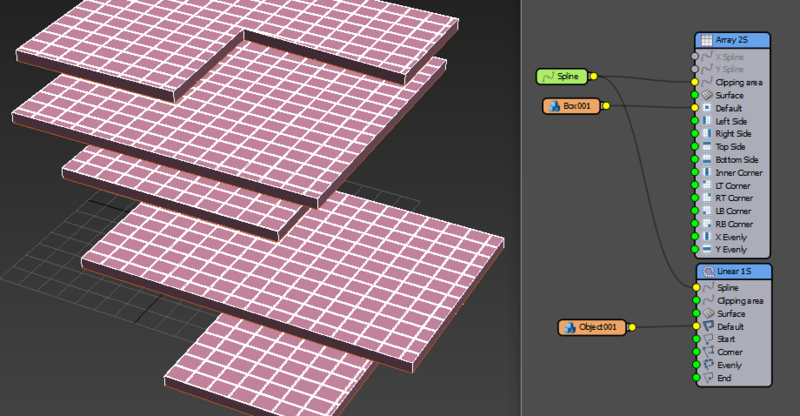 See the image attached where the walls follow the splines, but the floors/roof are not clipped per spline. I'm afraid, that as the Clipping Area needs to be projected (using the Z axis) to work correctly in this case it needs to be divided - each floor should be handled in a separate Generator. Attaching modified scene. Hope you'll find it useful. If I understand your request corectly then this feature is already implemented in RailClone 3 which should be available to beta test soon. In this version Clipping splines can be calculated individually, grouped using materials IDs and more. Hi, I instal beta of RailClone 3. But don't understand how to use this new feature. have 3 types of lamp, and 30 floor, how I can set one type of lamp on one floor? 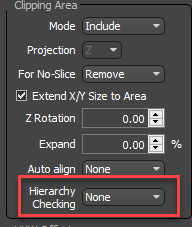 To achieve this with RailClone 3 you would set Clipping Area > Hierachy Checking mode to None. This will cause each closed spline to create its own array. Then, wire your 3 segments to a Selector operator. Export the Index value and wire this to a Random number node. Change the Minimum to 1 and the Maximum to 3 and change Generate On to X Spline Start. I've attached a demo file that will work with the current RC beta. I hope that helps, please let me know if you have any further questions. Thanks. It's Work. What if I want setup specific type of lamp to specific spline segment? At the moment to do that you would need to use the Generator's Limits > Materials ID feature. Create a new generator for each lamp type each with a separate ID. You can then change which segment is used simply by changing the Material ID applied to the spline. Thanks to your suggestion, in future version of RailClone 3 you will also be able to do this using the Conditional and Selector operators, which should make things a little easier. Attached is a file. Thanks for the feedback!